wozu unsere Gehirnaktivität, die Körper-Geist-Koordination, Sinneswahrnehmungen, unsere Gedanken sowie die Emotionen gehören - und natürlich unsere auf unser soziales Umfeld bezogenen Handlungsweisen. Je höher die Kohärenz der etwa 100 Milliarden Neuronen sowie ihrer jeweils ca. 10.000 synaptischen Verknüpfungen sind - also einem Netzwerk von etwa 1 Billiarde Schaltpunkten (Synapsen) - , um so größer ist die Geordnetheit der Gedanken, um so stabiler sind die Emotionen sowie die sozialen Qualitäten und Zielgerichtetheit unserer Interaktionen/Handlungen. Einen mentalen Zustand geringster Anregung entstehen zu lassen, ist sehr natürlich und geschieht bei jedem Menschen tagtäglich - und zwar jeweils beim Wechsel von einem relativen Bewusstseinszustand in einen anderen. Beim Einschlafen vom Wachzustand in den Tiefschlaf, beim Übergang zum Traumzustand (REM), während des Schlafes mehrfach jeweils beim Wechsel zwischen Tiefschlaf und Traumzustand und beim Aufwachen vom Traumzustand in den Wachzustand. eine Ruhe tiefer als im Tiefschlaf, dadurch eine umfassende Regeneration physischer, psychischer und mentaler Ermüdungserscheinungen. Diese Stresslösung und umfassende Erholung besitzt weitreichende Implikationen für das subjektive Wohlbefinden sowie objektiv für koordinierte, intelligenzoptimierte Verhaltens- und Handlungsweisen. 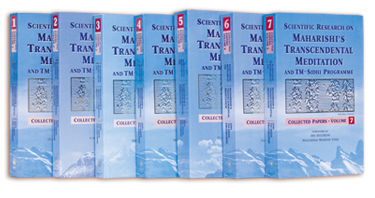 Hundreds of scientific studies have been conducted on the benefits of the Transcendental Meditation program at more than 200 independent universities and research institutions worldwide over the past 48 years. The National Institutes of Health have awarded over $26 million to research the effectiveness of TM for reducing stress and stress-related illness with a focus on cardiovascular disease. Findings have been published in leading, peer-reviewed scientific journals, including The American Journal of Cardiology and the American Heart Association’s Hypertension and Stroke. This newly completed study found that 106 at-risk adolescents in three high schools reduced their levels of stress, anxiety, hyperactivity and emotional problems when practicing the Transcendental Meditation technique for four months at school, as compared with controls. This two-year study of 250 students attending American University and surrounding colleges in Washington, D.C., found that the TM program produced beneficial effects for health, brain functioning and cognitive development compared to controls. This study of 103 people with coronary heart disease found that individuals practicing Transcendental Meditation for four months had significantly lower blood pressure, improved blood glucose and insulin levels (which signify reduced insulin resistance), and more stable functioning of the autonomic nervous system compared to controls. This eight-month study of 156 hypertensive African American high school students found that the Transcendental Meditation program reduced high blood pressure among the meditating students as compared with little or no change in the control group (twenty percent of African American teenagers suffer from high blood pressure). Two studies on 60 sixth-graders at two middle schools found the practice of Transcendental Meditation over four months positively affected emotional development in early adolescent children in a school setting. Meditating students also had significantly higher scores on affectivity, self-esteem and emotional competence. 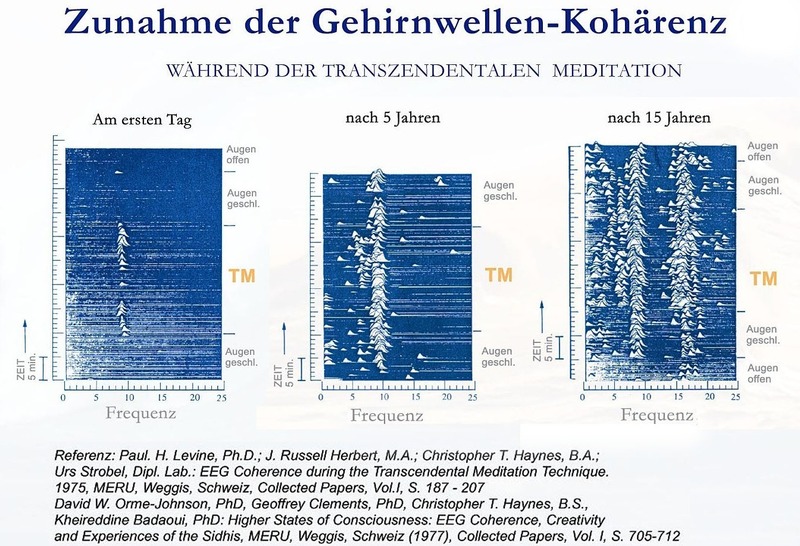 In this pilot study, 12 subjects practicing Transcendental Meditation for 30 years showed a 40–50% lower brain response to stress and pain compared to 12 healthy controls. Further, when the controls then learned and practiced Transcendental Meditation for five months, their brain responses to stress and pain also decreased by a comparable 40–50%. International Journal of Neuroscience 14: (1981) 147–151. Psychosomatic Medicine 46: (1984) 267–276. American Journal of Physiology 235(1)(1978): R89–R92. Motivation, Motor and Sensory Processes of the Brain, Progress in Brain Research 54 (1980): 447–453. International Journal of Neuroscience 10 (1980): 165–170. Proceedings of the International Symposium: Physiological and Biochemical Basis of Brain Activity, St. Petersburg, Russia, (June 22–24, 1994). Journal of Personality and Individual Differences 12 (1991): 1105–1116. Perceptual and Motor Skills 62 (1986): 731–738. College Student Journal 15 (1981): 140–146. Journal of Clinical Psychology 42 (1986): 161–164. Gedrag: Tijdschrift voor Psychologie [Behavior: Journal of Psychology] 3 (1975): 167–182. Dissertation Abstracts International 38(7) (1978): 3372B–3373B. Higher Education Research and Development 15 (1995): 73–82. Dissertation Abstracts International 38(7): 3372B–3373B, 1978. Memory and Cognition 10 (1982): 207–215. British Journal of Educational Psychology 55 (1985): 164–166. Journal of Social Behavior and Personality 6 (1991): 189–247. Higher Stages of Human Development: Perspectives on Adult Growth (New York: Oxford University Press, 1990), 286–341. Journal of Counseling Psychology 19 (1972): 184–187. Perceptual and Motor Skills 64 (1987): 1003–1012. Personality and Individual Differences 12 (1991): 1105–1116. Criminal Justice and Behavior 5 (1978): 3–20. Criminal Justice and Behavior 6 (1979): 13–21. The Journal of Creative Behavior 13 (1979): 169–180. The Journal of Creative Behavior 19 (1985): 270–275. Biofeedback and Self-Regulation 2 (1977): 407–415. Perceptual and Motor Skills 39 (1974): 1031–1034. Perceptual and Motor Skills 65 (1987): 613–614. Anxiety, Stress and Coping: An International Journal 6 (1993) 245-262. Hospital & Community Psychiatry 26 (1975): 156–159. Journal of Humanistic Psychology 16(3)(1976): 51–60. Gedrag: Tijdschrift voor Psychologie [Behavior: Journal of Psychology] 4 (1976): 206–218. Journal of Offender Rehabilitation 36 (2003): 127–160. American Journal of Psychiatry 132 (1975): 942–945. American Journal of Psychiatry 131 (1974): 60–63. Journal of Social Behavior and Personality 17 (2005): 65–91. Journal of Social Behavior and Personality 17 (2005): 47–64. Western Psychologist 4 (1974): 104–111. Electroencephalography and Clinical Neurophysiology 35 (1973): 143–151. Personality and Individual Differences 12 (1991): 1106–1116. Perceptual and Motor Skills 38 (1974): 1263–1268. L’Encéphale [The Brain] 10 (1984): 139–144. Hormones and Behavior 10(1)(1978): 54–60. Aids Care 25 (2013) 1291-7. SF AIDS Foundation/Maharishi University of Management. Submitted for publication. Journal of Personality and Social Psychology 57 (1989): 950–964. Psychological Reports 51 (1982): 887–890.